Industry Super Australia may help put a spanner in the works of FOFA reforms, with strident condemnations on the financial planning industry’s “extraordinary and unseemly scramble” to backtrack on the Labor-introduced legislation. 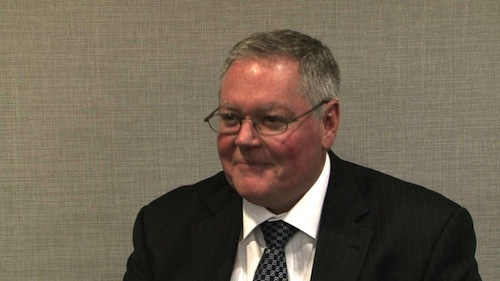 The industry super lobby group’s CEO David Whiteley spoke at the Financial Advice in Super Symposium in Melbourne – hosted by ISA on Friday – saying the proposed amendments to FOFA were “overreach” and would result in the country being worse off than before the legislation was passed. He stressed clients’ best interests will no longer be top priority if the amendments are passed and was unhappy that commissions – which ISA have long advocated against – may be brought back in, along with conflicts of interest. ISA chair and former NSW Liberal leader Peter Collins also spoke, calling for the proposed changes to be debated in Parliament as legislation – currently some of the changes are being treated as regulation and does not have to go through the House to come into action. The ISA has the ear of mainstream media and the public. But the industry super body’s stance conflicts with other financial service representative groups, such as the Association of Financial Advisers and Financial Planning Association – although the FPA has said it does not support commissions being brought back in. Yesterday AFA CEO Brad Fox called on financial advisers to get involved in a “grassroots campaign” to fully explain – to federal elected representatives in the lower house and the Senate – the implications of FOFA amendments on advisers and clients. “Some reports in the mass media are scare-mongering about consumer protections being stripped. That is not the case at all. I think there’s been some carelessness in reporting, and I think it’s important to have a balanced view out there,” he told Wealth Professional. Fox stressed the importance of advisers getting their voice heard if they care about the impact of FOFA – especially the possibility the amendments will not get passed. Well said again Craig, can't add much to that except to say that I agree with an earlier comment that the ISA and Whiteley need to be thoroughly investigated as like the Craig Thompson affair, into the mis use of member funds for dubious advertising and all the other non disclosed perks and lurks. They are a non accountable bunch of hypocrites who have nothing else to do but criticise and lie about the rest of the hard working advice industry. They are a media seeking bunch who have nothing of any substance to say and if they did, who cares? They are not even listed in the phone book. and the payment of that commission is clearly disclosed within the FSG, SOA, the PDS and the Application Form for that financial product and the client is required to sign off on the FSG, SOA and the Application Form agreeing and consenting to the payment is there any difference whatsoever to the client's position compared to the adviser being remunerated via an Adviser Service Fee at 0.5%p.a that is disclosed, signed off and agreed to by the client when both of these payments are paid from the clients invested funds? If you do not provide service to a client they will leave you and you will subsequently forgo either the commission , the Adviser Service Fee or the Fee for Service payments you may have previously received. The abolition of the option of commission as a choice of remuneration for advisers and a choice of paying for advice for consumers was never about the consumer, it was about the Labor govt exerting control, imposing massive implementation costs on the financial services organisations and removing choice from the consumer. It was effectively a statement by the Labor govt to say that financial advisers cannot be trusted so we will control the process. The advertising company given the task of producing the ISA's "anti-commission" campaign would no doubt have charged exorbitant fees.The members would have a right to know the amount of the payment made and was it charged as a commission ? Was the advertising company employed on a performance payment based on the advertisements impact and demographic reach? Did the advertising company take David Whiteley or the whole board of the ISA to lunch and pay the bill ? Was their judgement on behalf of their members therefore conflicted if in fact this was the case ? You get paid in the financial services industry when you first and foremost sell yourself then sell advice and possibly, but not necessarily sell a financial product. Anyone who thinks otherwise is just plain wrong. If an outcome of the review of FOFA was to reinstate the option for consumers to pay for advice via clearly disclosed, non-conflicted and a mandated, limited commission payment, it would extend choice for consumers to seek and pay for advice. Disengagement of consumers seeking financial advice is not about how advisers are remunerated, it is about consumer education. So there's a difference of opinion between ISA and "other financial service representative groups". Well firstly, ISA is not a financial service representative group, they are a product provider. And they are not interested in the best interest of the individual. They are interested in protecting and growing their business. That's the bottom line. If they were interested in the best interest of their members (and the public more broadly), they would stop attacking advisers, embrace the value that advice brings to the average person, and would work collaboratively with advisers. If they did it would benefit them, us, and many of our clients. You are very right, Mel. REST does not have a 'HARDSHIP' provision so a young mother who has cancer cannot access her tiny super amount to pay bills w/o going through a long drawn out Human Services for a portion of the tiny amount. When are you going to give air-time to all of the problems we deal with for our clients in Industry Super Funds? Fair play would allow us our say against the ISN instead of constantly quoting David Whoever's uneducated biased bleating. The latest problem? A client who was a sole-trader contracting bookkeeping services, now terminally ill with cancer, whose claim is being held up because she hasn't provided details or tax returns for her "Company". Seriously? The less Mr. Whiteley is listened to or given exposure of his comments the better for the industry. I think Craig Yates makes a very good point: can we have an audit of how much of members money has been spent on the TV advertising and how is that in the interests of the members. Usually if your doing a 'good' job on behalf of members why the need to advertise, after all it is a captive audience. Mr Whiteley I have a rule in life, the louder someone crows about how perfect they are, the closer eye you should keep on them. It has been a very good strategy for avoiding trouble. There are a huge number of indicators telling me all is not perfect in the ISA. Very load claims that they are perfect, claims of regular and consistent market out performance in all asset classes, entanglement with the very dodgy Labor party, entanglement with the very dodgy unions and screams about withdrawals to SMSF (getting to the bottom of the liquid asset barrel) and the extreme action to plug the hole by trying to ensure more money gets channeled into the ISA through the ridicules My Super legislation. ISA are complaining that their attempt to ensure more air is forced into a deflating boat is costing their customers more. There is plenty of smoke to warn of an impending disaster in this area. The reason that Mr David Whiteley is so upset at the possibility of financial planner's remuneration options including commissions, is that over the last several years, the ISA has spent countless $millions of their member's funds on misguided,vitriolic advertising campaigns in an attempt to portray any adviser or planner who is remunerated via commission payment, irrespective of the client's choice,disclosure or clarity of available remuneration options, or dedication to clients best interest, as a conflicted and irresponsible means by which to pay for advice. Of course, all the members monies that were used to fund the advertising blitz were given full disclosure and choice as to whether they wished to or agreed to participate in the onslaught prior to their monies being quarantined for this purpose ?...weren't they? ?